So you have an iPhone 4 or iPhone 3GS (New Bootrom), running iOS 4.0.1, with SHSH blobs saved on Cydia, and you want to restore your iPhone again to iOS 4.0.1. Now that Apple has stopped signing iOS 4.0.1, you wont be able to restore your iPhone 4 on iOS 4.0.1 by simply pointing iTunes to iOS 4.0.1 ipsw file. Because if you do so, iTunes will throw an error: “This iPhone [your name] iPhone could not be restored. This device isn’t eligible for the requested build. Now to fix this error, you will have to make a couple of changes in your system’s “host” file, by pointing it towards Cydia server instead of Apple’s. Also this is not it, you may also receive another error during restore: 1004, or 1015 from iTunes saying: “The iPhone [you name] iPhone could not be restored. An unknown error occurred (1004)”. The following step by step instructions will guide you on how to fix these errors so that you can restore any of your new iOS devices like iPhone 4 or 3GS to iOS 4.0.1 successfully. 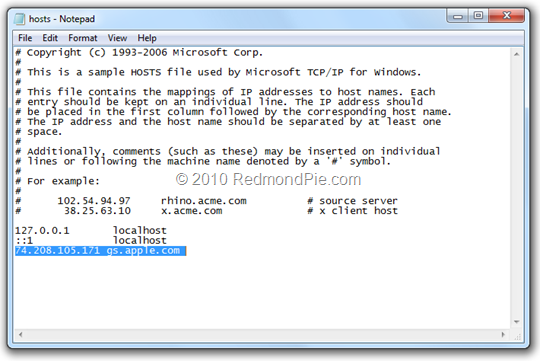 Step 1: Download the required iOS 4.0.1 ipsw firmware files from here. Once you are done with the jailbreak, you can follow our step by step guide posted here to unlock your iPhone on iOS 4.x, on any baseband using Ultrasn0w. why wouldnt you just use umbrella for the whole process, no need to use anything else, or edit/modify?? In my case this method didn´t work, the only way to get firmware back from 4 to 3.1.3 and now, vice-versa, was through TSS server function of TinyUmbrella. I think shsh for 4.0 , 4.0.1 and 4.0.2 is still open. I save mine for iPodTouch3G and managed to upgrade (from 3.1.3) just yesterday (when shsh for 4.0 and 4.0.1 is announced already close couple days ago). I mean if i don’t succeed save the shsh, i wouldn’t be able to upgrade to 4.0 right? It’s crazy that apple makes their money off us consumers and then we have to jump through hoops to enjoy our purchased iphones. Supply and demand I guess, right. Thank god for the Dev Team… Make sure you donate or buy a app from these guys. They deserve our support! Is there any way we can downgrade without saving the SHSH blob on cydia first? Because I had to restore it to 4.0.2 and I’m trying to downgrade it so I can jailbreak/unlock it. Help please!!! Can I downgrade it without saving SHSH blob on cydia first? Currently running 4.0.2 because I had to restore it. I’m trying to downgrade it so I can jailbreak/unlock it. Help Please!!! thats right i just start the TSS server and my iPhone restored successfully with itunes until the TSS Server working ..
i figured out this method by accident lol…hmmm i wonder what happens when i click kick me out of recovery mode lol and got fed up with the errors so i tried DFU mode for the hell of it and it worked! i wish there was a way to show saurik how much we appreciate his SHSH server.. w/o that we’d all be screwed! 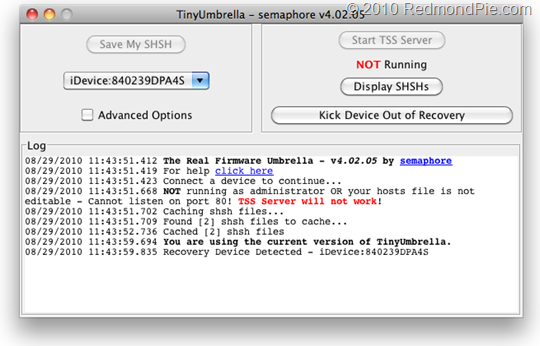 Can tiny umbrella be used to bypass activation of the iphone? yeah, anyone tried this?? Im waiting on a ONEsim, been nearly a month!!! Be good to get past this activation problem! 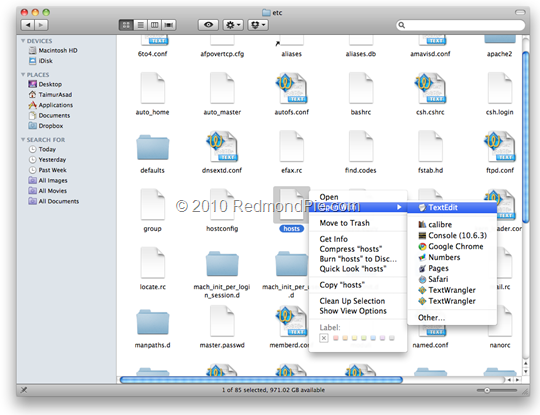 Is there any reason you shouldn’t remove the host file modification after the restore is finished? hi , i hv iphon4 with 4.0 & i m trying to update it to 4.0.1 through itunes but i m getting error 3194 , i hv SHSHs on file , any help ? Thanks . What if your 3gs is 4.0.2 is posible to downgrade with this method to 4.0.1??? i just did it to my new out of box 3gs. i put my 3GS in “recovery mode” and it worked with TinyUmbrella. You DO NOT have to put it in DFU mode more risk for error. You can leave it, but iTunes may have trouble connecting to Apple servers when you actually want it too. What I do is rename the original host file to “ORIG_hosts” and leave it in the /etc folder so when I’m done with the firmware install with iTunes, I just rename the original file back to “hosts” and the altered file gets changed to “Cydia_hosts”. 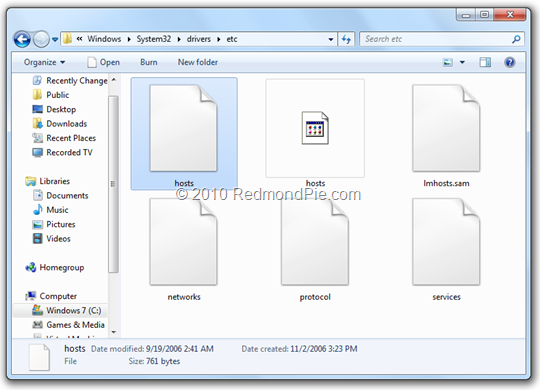 After you have the two hosts files set up, it’s as simple as renaming the file depending on your needs! My iPhone 3GS is getting stuck half way at the restore progress bar – if I disconnect it then, it goes into recovery mode, and when I try “Kick Device Out Of Recovery Mode”, it restarts in Recovery Mode. . .
i want to restore it due to some problems after jailbreaking it!! i tried to restore it many times but it keeps giving me errors 3014 or 3001 or something like that! i also did something stupid and deleted the cydia from it?? When I ran Umbrella, the option to “kick device out of recovery” was not an option at all; the button was grayed out. Fortunately, I had an old AT&T sim card lying around and it did the trick. I did downgrade 3GS from 4.0.2 to 3.1.2 with this method. It works perfect, worth to try!